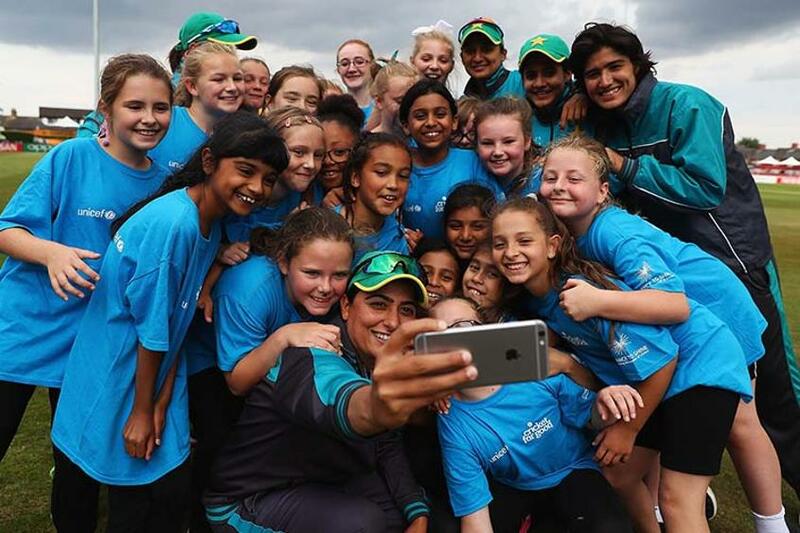 Pakistan captain Sana Mir was full of praise for the ICC’s Cricket for Good coaching clinics, which she helped to ensure finished in style in Leicester today, with the final session involving 30 lucky pupils from nearby Marriott Primary School in Leicester. The coaching clinics, run in partnership with UNICEF and the UK’s cricket-based charity, Chance to Shine, have been a major initiative during the 2017 ICC Women’s Cricket World Cup, helping to inspire the next generation of cricketers to pick up a bat and ball and play the game. Each of the eight teams involved in the ICC Women’s World Cup has lent a helping hand at a coaching clinic for local school children during the tournament, with sessions taking place across the four group stage venues in Bristol, Taunton, Leicester and Derby. Sana was joined today by her Pakistan teammates Javeria Wadood, Nain Abidi and Asmavia Iqblal, in Leicester ahead of their final game against Sri Lanka on Saturday. And the 31-year-old said it was great to see children get such a fantastic introduction to the game. She said: “It’s a wonderful initiative, we enjoyed our time with the children, they are getting to learn about cricket, they are excited about the basics, how to bat and bowl which is really nice. “We got them to do some bowling and throwing and a bit of batting practice, then they played a game with a soft ball. They are really enjoying themselves and they picked it up very quickly. “It’s wonderful for us and it’s good to be enjoying cricket with the younger generation and see how much they are into the sport. It’s good to see them smile and enjoy the sport. Women’s cricket continues to go from strength to strength and Sana admitted the facilities and drills which she was leading was in stark contrast to her first memories of the game. She added: “My story is very different, I played on the streets, we didn’t have coaching clinics or academies, the streets of Pakistan was my academy. I played with my brother who coached me. “He used to explain everything to me and I used to go with him to games on the streets. We played on the road and there was houses on both sides, if it went in a house it was out.